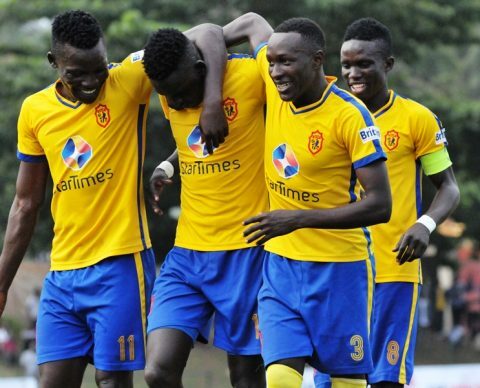 NJERU – KCCA FC will be hoping they can continue their fine run of form when they travel away to Bul FC in the StarTimes Uganda Premier League on Saturday afternoon. Mike Mutebi’s side are on the back of a 8-2 victory at home to Amuka Bright Stars in the Uganda Cup which came just days after registering their maiden away victory in continental football (2-1 vs Mtibwa Sugar). The Kasairo’s are also on the back of a 3-0 victory at home to Paidah Black Angels in the league, three points that saw them pull as many (points) clear of second placed Onduparaka in the standings. Despite the form, Mutebi thinks it will not be an easy game for his side. “We are prepared for the challenge ahead of us and it is good that we are currently doing well amongst the teams trying to win the league, said Mutebi ahead of the game. “We know it is not going to be a walk in the park because Bul has always given us problems and we know it is going to be difficult on Saturday but we have enough in our armory to win it. “We are in a rich vine of form via scoring which gives us confidence against whichever opponent we come up against. KCCA are expected to still be without strikers, Patrick Kaddu and Allan Kyambadde so Mike Mutyaba who struck a hat trick against Amuka Bright Stars will most likely lead the attack again. Julius Poloto and Bernard Muwanga returned from injury in the Uganda Cup and it remains to be seen if they will get the nod to start their first League game in a while. For Bul, who defeated Kataka in their round of 64 Uganda Cup on Sunday, they come into the game on the back of a 3-1 home loss against Vipers in their last League outing. Peter Onen’s side have been inconsistent all season despite losing only three games all season. They currently sit 7th on the log with 19 points from their first 12 games. Is will be the 15th League meeting between the two sides since Bul gained promotion to the top tie in 2014. In the first 14 meetings, KCCA has won 7 and lost only two (5 draws). The season, KCCA defeated Bul home and away including a 3-1 win for the Kasasiros in the reverse fixture. Going into Saturday’s game, Bul have won only one of their last six League games (D3 L2). The win was in their 1-0 home victory over Onduparaka at the start of this month. At home, Onen’s side have lost only two of their first six games this season (W3 D1). For KCCA, they go into the game having lost only one of their last 17 league games (W12 D4). The single loss in that period was in the 3-2 defeat at Express on 11-12-2018. Away from home, Mutebi’s side have lost only one of their last eight League games (W5 L2).